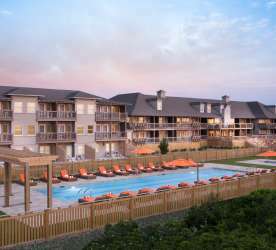 There is a common “affliction” for those who wander the shores of the Outer Banks. It starts innocently enough, with that first tilt of your head down at the sand below. You are looking for treasure! Although we’d all like to get our hands on a gold doubloon, anything will do. Whether it’s an actual piece of eight, an intact whelk shell, or even a pretty rock, anything qualifies to beachcombers. Eventually, though, you’ll find your first piece of sea glass and, in an instant, it will become your mission to find more. From that moment on, everything changes. We find beachcombing goodies from one end of our shores to the other. But one day it’s here, the next it’s there, and some days it’s everywhere. And some days it’s nowhere. There is no rhyme or reason as to why it appears one day and not the next. Some people will tell you to look after a storm. While plenty of debris is scattered on the beach after a storm, that doesn’t typically include sea glass. No one knows for sure when or where it will appear and that, too, is one of the draws for collectors. Collecting sea glass has become so popular in recent years that during the in-season if you see footprints on the beach, the chances are that you have missed it. Never fear, though, because each wave presents a new opportunity to find an elusive shard. 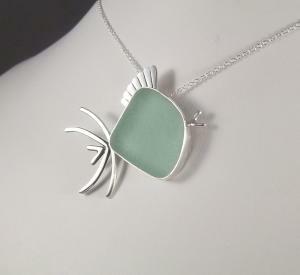 Everyone agrees that sea glass is beautiful and we all pick it up for just that reason. Some of us are casual collectors who only wish to add to our collections in a small dish that sits in the window above the kitchen sink. Some of us do more with the glass, like making artsy picture frames, ornaments, mosaics, or, as is the case with me, fine jewelry. The possibilities are endless because regardless of what you do with something beautiful, it will always remain just that. Beautiful. 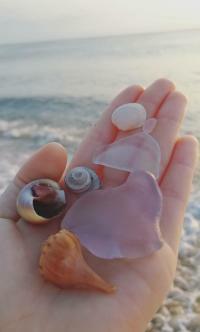 Although we initially admire and collect sea glass for its beauty and rarity, we yearn to know more about it. The first question that comes to people’s minds is, ‘what is it?’ Simply put, sea glass is manmade glass that has found its way into the ocean and spent a significant amount of time tumbling underwater and undergoing both physical and chemical changes before eventually making its way back to the shoreline. The physical part is easy enough to figure out, but the chemical change that is taking place is what really changes what was once trash into treasure. The chemical transformation is a process called ‘hydration’ and takes many years to fully accomplish. Hydration is the sole reason that sea glass cannot be duplicated in a machine. If the Ph level of the water is 7 or above, which it is in all the oceans of the world, then the water becomes caustic, or corrosive. At that point, the glass begins to undergo a molecular change. Essentially, it is disintegrating on a molecular level, or coming apart. This process typically takes generations for glass to fully hydrate in the ocean and become that new animal that is coveted so much by so many. 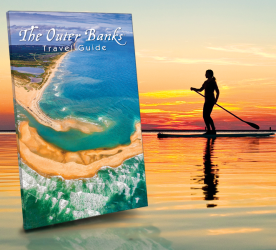 Along the Outer Banks, some of the glass gets there innocently enough. Perhaps a kid left a Coke bottle on the beach in the 70s, or maybe a group of boys took their slingshots and a handful of marbles out onto the fishing pier in the 50’s to see who could fire theirs the farthest. However, the sea glass we find here may have had a much more sinister beginning. Remember, we have over 2,000 documented shipwrecks along our coastline since the early 20th century alone. Our history is also neck-deep in pirate lore, so we certainly have just as much a chance of finding shards of glass from that time too. We also know that the Dutch were bringing gin here in glass container vessels from the late 1700s through a good portion of the 19th century. To be sure, several hurricanes have made their way along our coast and taken dozens of houses, and all of their contents, back out to sea. Those same storms have taken down many telephone poles that, up until the mid to late 1970’s, were topped with colorful glass insulators …they’re out there too. Our history is also rich in stories of rum-running during Prohibition. It’s not uncommon to find an embossed shard from the faceplate of a liquor bottle from the 1930’s. For years during World War II, the Germans sunk ships off our coast unchecked. The list of possible origins of the shards we find along our shores goes on and on. 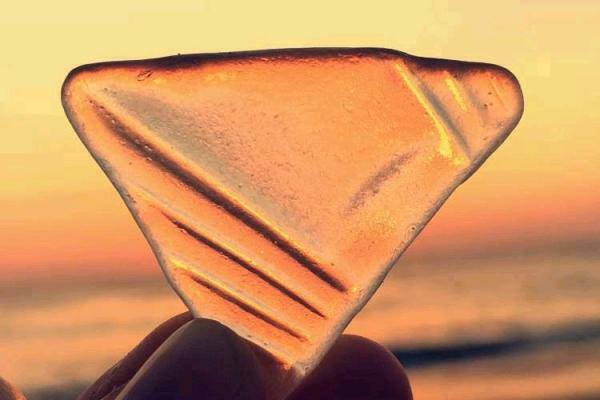 On the Outer Banks, the shards of sea glass are historically significant pieces of time, and each one of these relics gives us a glimpse into the past. Because of this history, many are drawn to the romantic appeal of its previous existence. Remember, the glass once had a purpose. Someone was doing something with it, using it in their life. The mystery of the history that accompanies the shards is just as much of an appeal as finding a vibrant rare color. To those of us that collect, we get it. From the very first moment we reach down to pluck it from the sand, sea glass captures our attention and begs our admiration. Pure and simple, sea glass is treasure. Avid sea glass collector and artist at Sea, Sand and Hand.